We do our best to make sure the mobile tyre fitting service you experience is beyond expectations. Across the network, we're all dedicated to ensuring that you'll love what we do and how we do it. After all, it's you who'll recommend and refer us to friends and family alike. Customers regularly return feedback and each and every post you'll read is 100% genuine. We hope to add yours soon too! First time I've used a mobile tyre service. Only did so this time because I had a flat and no spare. From the first phone contact I felt that Hometyre knew what they were doing and they did not try to 'upsell' just do the best for my particular situation. The man on the phone was friendly and efficient. The fitter arrived a few hours later. Again friendly and knowledgeable also local. The tyre changes were completed without drama, quickly and painlessly. The only complaint? Well, you do pay a little more than you might by shopping around and getting tyres delivered from the other end of the country. However, I think the excellent service and peace of mind is well worth the small premium. Cannot recommend highly enough! Brilliant service from Richard, i have never seen a tyre technician take so much pride in his work, his attention to detail was brilliant. Will effeminately use again! I found the service from Hometyre quick and efficient. The two fitters, Nick and Shaun, who fitted my new tyres were both curtious and friendly I would have no hesitation in using Hometyre again. Richard was professional, courteous, and very helpful. 10/10 I'll be back. Thank you. I just wanted to say I was very impressed with your service, and I have recommended your company to friends on Facebook - I will 100% call you again if I'm in need! Excellent service/price, and the gentleman who came out was very friendly, and efficient. I liked that you check everything is in order before arriving as well. Top work guys! Your colleague Ben who attended was great! Thank you very much. Your engineer was brilliant. Arrived early and great service. I received fantastic service from Hometyre. They came that day, changed my tyre, swapped it round to balance my treads and checked all treads. Great service at a cost the same as most centre's would have charged me if I could have got there. First class service from Craig! Very prompt and quick service. The tyre fitter was knowledgeable and informative. Would definitely recommend. Many thanks. Could I record my appreciation for your fitter, Shaun. He was prompt, professional and helpful. I shall definitely use your service again. Massive thanks to you guys. Completely saved our holiday week by replacing the tyres on our caravan at Fleet services on our way from Bristol to the Norfolk broads. The fitter couldn't have been more helpful and made a particularly stressful couple of hours dissolve away completely. If you're going away with your caravan, don't forget to get the tyres checked first! Both of ours let go and when removed there were massive cracks in them. We didn't even think to look. This is the second time Richard has fitted Tyres at my home and the first time he headed out to rescue me from a puncture. Very pleasant guy, we always have a giggle and he always provides a top class professional job. Used Hometyre for the first time this month. Very impressed with the service. Richard arrived at exactly the time he said he would and provided a quick and efficient service in a polite and professional way. The four tyres I ordered also worked out at £20 less than I had been quoted by two other local tyre companies. Will definitely use Hometyre again and will recommend to family and friends. Very happy with the service. Fitter was prompt, professional and helpful. Will use again. I would like to send you review about Mark who fitted tyres for our caravan, very impressed with work done . I rate 5 star ⭐️ ⭐️⭐️⭐️⭐️. Brilliant online service to order very quick response very clear emails and Mark arrived on time very understanding as we both are deaf , communication was good with Mark. We are pleased with Hometyre overall with good deaf awareness. 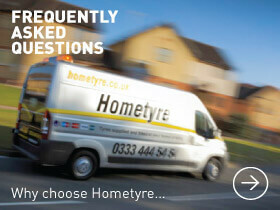 I highly recommend to all our friends to use Hometyre very convenient to use online as no need to phone. Thank you Mark for an excellent job, was much appreciated! I was extremely grateful and pleased with the service I received from the team and will not hesitate to call again in the future if I have any problems with tyres.